Drive to Airport for the flight from Kathmandu to Lhasa on Air China. The flight takes about an hour and thirty minutes.The Trans Himalayan Flight gives you a great aerial views of Mt. Everest and other Himalayan Peaks. Arrival at Gonggar airport around 14.00 hrs. local time. After clearing immigration and customs it is around a two hour drive to cover the 93 kms. 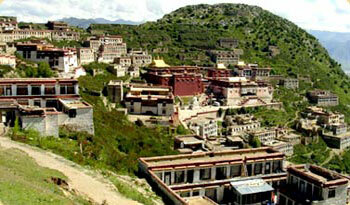 to Lhasa, situated at an altitude of 3670 meters. Upon arrival we check into the hotel right in the heart of the old city. Three days are spent in Lhasa, we visit the Potala palace, Sera and Drepung monasteries, the Norbulinka palace and Jokhang temple including the surrounding Barkhor market. Today is a long but rewarding one to Gyantse we need to cross the Kamba la (4794m) and the Karo la pass (5010m), both passes provide some spectacular views. After the Kamba la we pass near Yamdrok tso also known as the Turquoise Lake. Altitude 3900mtrs.before arriving at Gyantse and our hotel. In the morning we visit Gyantse stupa and monastery before continueing our journey to Shigatse and a visit to the famous Tashilumpo monastery.where there is an enormous Buddha.The manastary remains the seat of the Panchen Lama. Altitude 3800m. The journey today travels over two high passes with fine views,our lunch is taken at Lhatse and depending on how much time we spend during the morning in Shigatse we might stay overnight in Lhatse. Altitude 4350 m.
Begins with the Tsho La (4500m) and ends with the spectacular views of Mt. Everest from Rombuk monastery. Relax tonight and stroll around the monastery. Altitude 5050m. Up early in the morning for a two and half hour leisurely walk (one way) to Everest base-camp (5200m) return early afternoon and head to Lao Tingri. Lao Tingri is a small Tibetan town that argueably offers the best views of Everest from anywhere. Altitude 4200 m.
Today we travel back to Kathmandu,the highlight of the day is the fantastic view of Everest from the Lalung la pass (5050m). In the evening relax in Kathmandu. Day 11 :Free day in Kathmandu sightseeing can be arranged if wanted. Day 12 :Departure for onward destination.